Now that the monsoons are in full blast, tomato fungal diseases are showing up with all the moisture. One of them is Early Blight. It is caused by a fungus called Alternaria solani. Early Blight is a fungal disease that attacks tomato plants starting on the bottom leaves of the plant and works it’s way upwards. The leaves start turning yellow and get blotchy. If left unchecked, it can take over your plant killing it although it won’t die immediately. Where does it come from? It comes from water splashing soil up on the lower leaves, allowing the fungal spores to colonize on the leaves. The culprit is a bad soil fungus (there are good soil fungus as well). That’s why you always see it start on the bottom leaves. Early Blight should not be confused with Late Blight which is prevalent in northeastern United States. We don’t have Late Blight out here in the southwest (at least not yet). -There are several things you can immediately do to help with this disease if you get this. The first thing you do is trim off the affected branches where the leaves are yellow. Keep trimming up your plant as needed and spray with an organic fungicide like Serenade. -Disinfect your shears between plants by dipping the shears and your hand in a container of water with about 10% bleach solution. Alcohol also works. Be sure to disinfect your shears between plants because you can spread Early Blight. -I like Serenade, an organic fungicide which provides protection from a broad spectrum of common fungal and bacterial diseases. It is a biological fungicide, meaning it uses other spores that crowd out the Early Blight spores. Spray it on when the leaves are dry. It is rainproof, non-toxic for bees and other beneficial insects. Respray every 5-7 days. Spray all parts of the plant-both on top and underneath till dripping. Serenade is also good to spray on other vegetables. Spray for powdery mildew on squash, cucumbers and melons and leaf rust on beans. I use it for all my vegetables. Don’t wait till you get the disease—it works best as a preventative but you can control many fungal diseases with Serenade. -In addition to trimming the affected leaves, trim off any branches or leaves that touch the ground. I never let any leaves or branches touch the ground, trimming them up about 12 or more inches. -Another option is to stake or tie up any branches that might touch the ground. –Mulch with straw underneath the plant so the soil can’t splash up on plant when it rains or if you water overhead. This is key to help prevent Early Blight on your tomatoes. I do it the minute I plant my tomato plants in the spring and add more straw as the plant spreads till eventually the whole bed is covered with straw. If you didn’t do it this year, you can still add straw now. Besides it’s also great for keeping moisture from evaporating in our hot sun. -If space allows, rotate susceptible crops every 3 years. Just change where you plant tomatoes every year. Holy Cow! Hail the size of quarters and bigger! 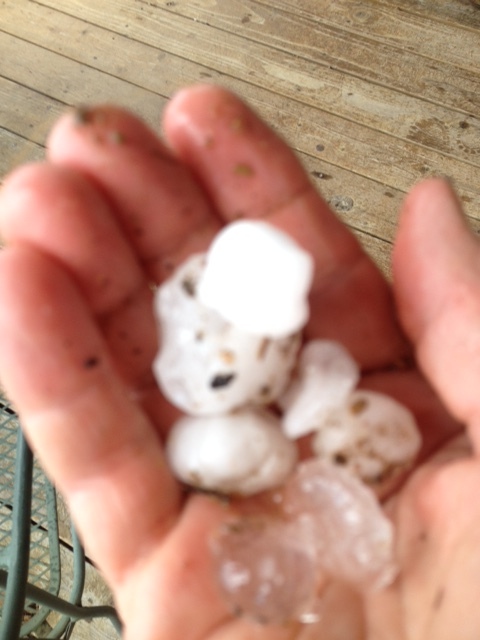 Wednesday we got two huge storms where hail was between the size of quarters and ping-pong balls in some places. I’ve never seen hail that big here in Santa Fe. Sorry for the blurry picture but our hands were shaking! Lots of damage was done in many people’s gardens, destroying or severely damaging many vegetables and fruits. Whole leaves were torn off or plants shredded. Most of mine were spared as I had the vegetable plants covered with row cover, and it took the hit instead of the plants. Believe it or not some plants will come back and be ok for those of you hit hard. We will be a couple of weeks behind but the season is not necessarily over. Check your plants and if the center of it where new growth comes from is intact, it will probably grow back so don’t be so quick to pull it. I will wait for about a week to see if they show signs of new growth. If they do, I will trim back the damaged foliage but not before. Remember their root systems were not hurt so they have a good chance to recover. Meanwhile I would spray a fungicide on them as they are weakened and more susceptible to disease, especially fungal diseases like early blight and powdery mildew with all this wet weather. You could use Neem, OR Copper spray OR Serenade to help ward off fungal diseases. All are organic.